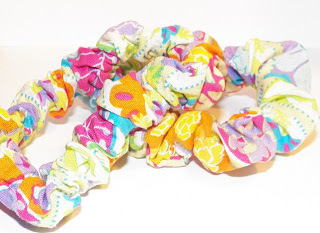 Scrunchies are one of the easiest hand sewn projects to make, and they are super handy. I use them at the gym a lot to pin back my hair. The ones above were made using jelly roll strips. If you've never done any quilting, you may not know about jelly rolls. They are strips of fabric cut selvage to selvage and 2.5 inches wide. There are lots of them available on Etsy. My daughter and I use them a lot for small sewn projects. You can make 2 matching scrunchies from 1 strip, 14 inches of elastic and thread. Cut the strip in half to make 2 22 inch strips, and cut 2 pieces of 1/4 inch elastic that are 7 inches long. Fold the strip in half lengthwise, right sides together, thread a needle with a comfortable working length of thread, and make a couple small back stitches to start the sewing, then sew down the length 1/4- 1/3 inch from the edge. You can use a running stitch or back stitch. If you use a running stitch, make a back stitch every few inches to prevent accidentally gathering the fabric. Put the safety pin on one end of the open tube through just one layer. Push the safety pin with the fabric through the length of the tube to turn right side out. Attach the safety pin to the elastic and use it to thread the elastic through the tube, gathering the tube as you go and being careful not to pull the end all the way through. Bring the two ends of elastic together, overlap and stitch securely. Then tuck the edges of the tube in 1/2 inch, and slip stitch the ends together to close. Repeat for the matching scrunchie. This makes a good project for kids as well, and picking their favorite colors from a jelly roll can be a lot of fun.